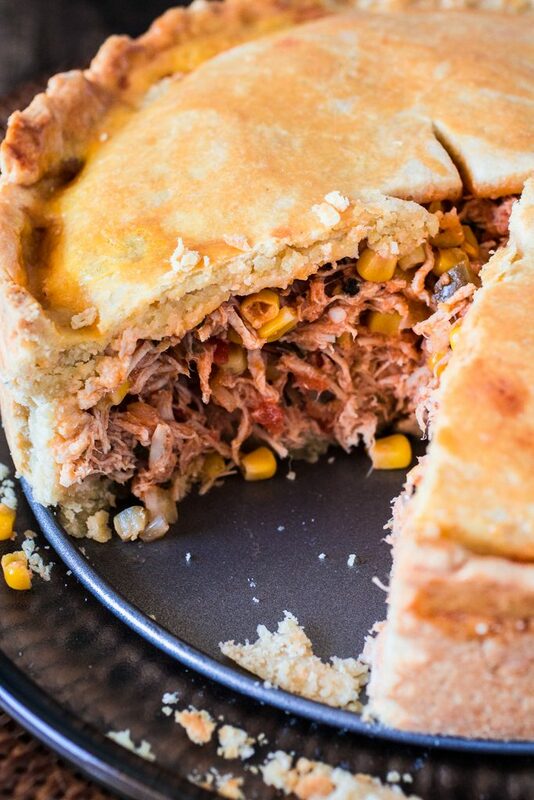 This is not your grandma’s chicken pot pie, with all due respect. 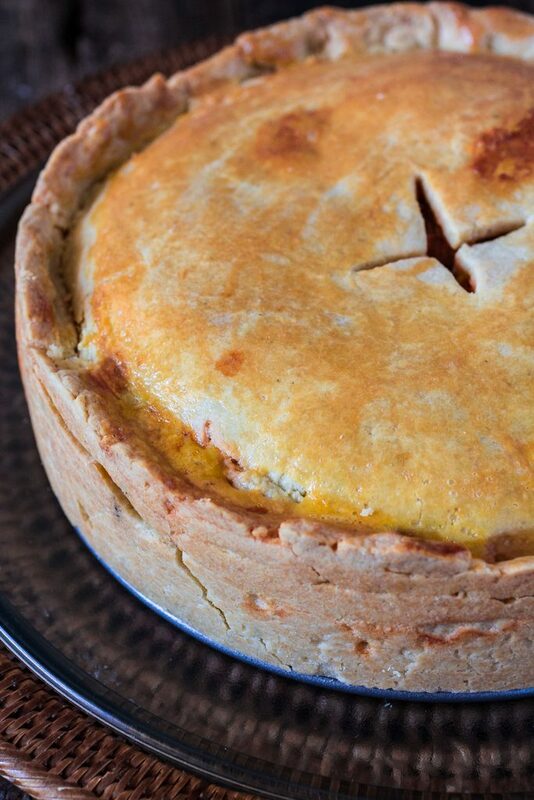 This is Brazilian Chicken Pot Pie (or Empadão de Frango), aka Best Chicken Pie In The Whole World. And it is really different than a regular pot pie. As in, I don’t even know why I named it “Brazilian Chicken Pot Pie”. Translating things sometimes is a challenge for me…? But titles won’t matter once you bite into this savory piece of heaven. 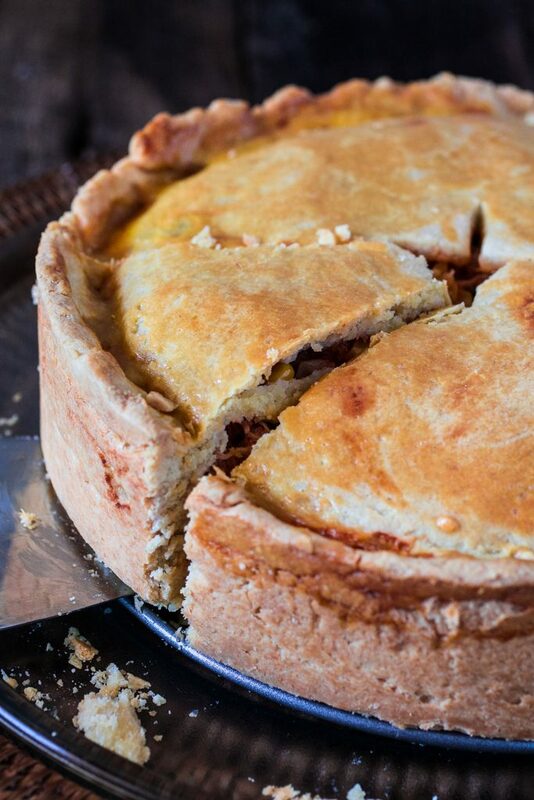 The buttery and flaky crust melts in your mouth and the pie has so much creamy filling that each bite is full of all the goodness that makes this pie such a hit! If you’ve ever been to a Brazilian birthday party, chances are you’ve tried an “empadinha”. Empadinhas are the mini (and more popular) version of an empadão, made of either hearts of palm, chicken or shrimp. They are very popular at parties but can also be found in pretty much any padaria (Brazilian bakeries). For me, they taste like childhood. From a time when I didn’t have a worry in the world and paying the healthcare bill wasn’t on my to-do list. As a matter of fact, to-do lists were nonexistent! I somehow remembered the tasks “do my homework” and “play with my friends” just fine. Oh, how I miss being a child! And since going back in time isn’t an option – Believe me, I researched! – I have to completely rely on my palate to evoke all those memories. I believe I just described the concept of “comfort food”. 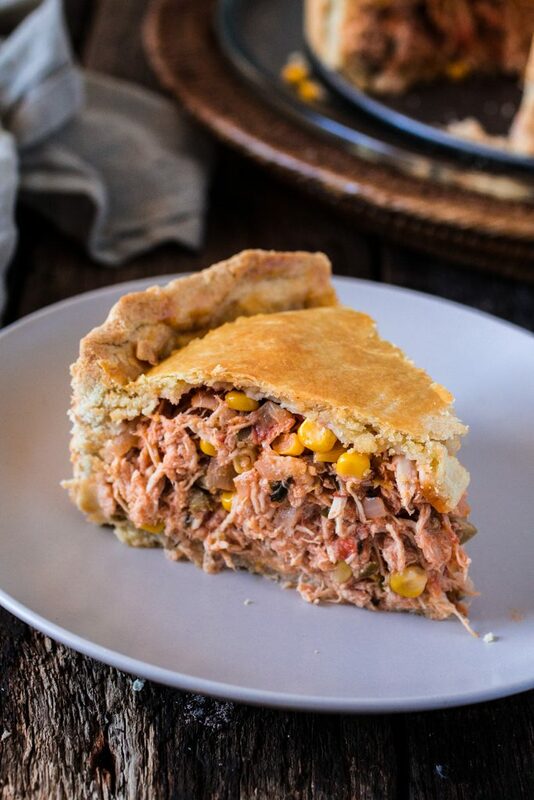 And that is what an Empadão – or Brazilian Chicken Pot Pie – is: the ultimate Brazilian comfort food! What I love about Empadão is that the filling, although creamy, is not as saucy and liquid-y as the filling of an American chicken pot pie. I usually serve my Empadão with a simple green salad and, sometimes, with rice. It is no secret that we Brazilians eat everything with rice! Can you blame us? Rice is delicious! I truly hope you guys enjoy this recipe. In fact, I know you will! So much so that I recommend you double the recipe so you can make two pies. You can freeze the second one and have it in the freezer for when you crave something comforting and delicious for dinner! In a large sauté pan, over medium heat, add the olive oil and, once hot, sauté the onions and garlic until translucent, about 2 minutes. Add the tomatoes and cook them with the onions and garlic for a couple of minutes, until softened. Add the shredded chicken,olives, corn (if using), peas (if using), hearts of palm (if using), tomato sauce, hot sauce and stir to combine. Then, add the chicken broth and the flour dissolved in milk. Lower the heat to medium low and cook, stirring often, until most of the liquid is gone and the filling is creamy and lightly thickened, about 10 minutes. Add the chopped parsley and stir to incorporate. Cool completely before assembling the pie. Add the egg yolks and stir using a wooden spoon. Then add the butter and use your fingers to work the butter into the flour, until the mixture resembles coarse sand. Add the water, a few tablespoons of a time, and continue working with your fingers until the dough comes together. You might not need all the water! Wrap the dough and chill for 20 minutes. When the dough is chill, cut 1/3 of the dough and reserve. Roll out the remaining dough to about 12" round. Place the pastry in a 9-inch spring form pan, making sure the dough also covers the sides (since we have lots of filling! ), and prick it all over with a fork. Add the cold filling, smoothing it out so its evenly distributed. Then, roll out the remaining dough and place it on top of the filling, sealing the pie and tucking the edges. Using a knife, make two cuts in the center of the top crust, so that steam can escape while baking. Brush the pie with the lightly beaten egg yolk. Bake in the preheated oven for 25 to 35 minutes or until golden brown and the filling piping hot. 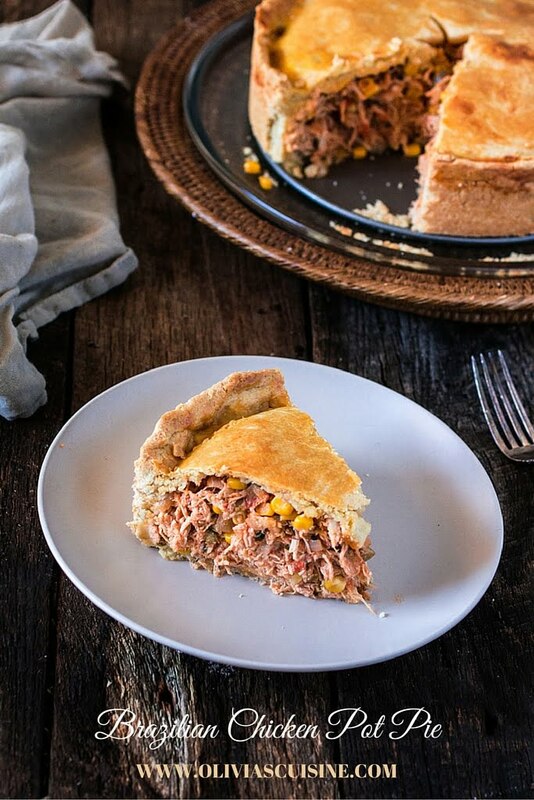 If you have some requeijão (or catupiry cheese) on hand, add about 1 cup on top of the filling, before closing the pie with the top crust. This is mouthwatering Olivia. Look at that! Love the filling, chock full and not all gravy at all. The dough looks like it holds it all well but is still flakey. Wow! ????? A piece of heaven!!! Thanks Olivia for the great recipe! Do you think I could fully assemble the pie, refrigerate, then put in oven to bake the next evening? Hi Christy, I think the dough would get soggy in the fridge because the filling has a lot of moisture. You could either have the dough (wrapped) and filling ready in the fridge and assemble the day of, or you can parbake until solid but not yet golden brown, and then finish baking the next day. I hope this helps! This looks delicious! I was searching online for Brazilian food to make and eat while watching the Olympics opening ceremonies and am so happy to have found your site and yummy looking recipes. I’m thinking of making this one, but don’t have a springform pan…do you think another type of pan would work? I have cast iron, and also several sizes/depths of round cake pans. Thanks for your help! Hi,What kind the flour did you use?